I like to think there's not much that passes me by with regard to soft synths that are available for Pro Tools in one form or another, but I must confess that the original Unitonic Aurora did just that. So it was with great interest that I got my hands on the new updated version of this mystery soft synth, Aurora 2.0. 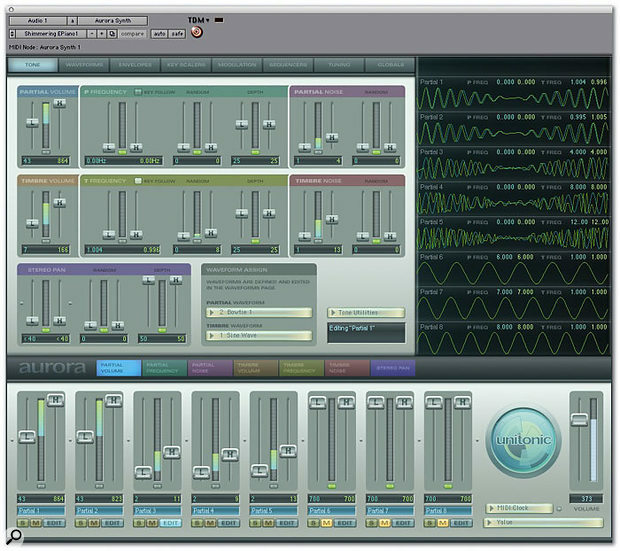 According to the press release, Aurora is a piece of software that fuses pure additive synthesis with frequency, pulse and noise modulation and non-linear wave distortion. Personally, I'm always a bit suspicious of synths that hide behind synthesis jargon as I'm not sure many people either (a) know what it means, or (b) really care. I'd much rather be stuck in a traffic jam than a linear vehicular anti-motion scenario generator, but that might just be me turning into a grumpy old man. Currently, Aurora is only available for Pro Tools HD Accel systems running Pro Tools 6.0 or later under OS 10.2.2 and above, although Unitonic say that a PC-compatible version should be available by the time you read this. Unitonic also say there will be RTAS and AU versions in the not-too-distant future too, so pretty much everyone will be able to have a go. A quick check at the Digidesign web site also confirms that Aurora is compatible with Pro Tools 7 too. Installation is simple, and Aurora is authorised to an iLok key, so obviously you'll need an iLok and an iLok account before you can get cracking. Once summoned into existence, Aurora 's user interface is large and easy to read. It's quite a change from version 1's Star Trek look, opting for a more friendly and inviting grey-and-pastel colour scheme instead. The main page is split up into three sections. The upper section is the main edit area, where you'll find a selection of tabs running along the top that switch the panel beneath to the various control parameter pages — tone, waveform, envelope, key scaler, modulation matrix, sequencer, tuning and global control. To the right of this is a graphical display that provides a snapshot of each of your chosen waveforms and how they're being affected by the parameter changes happening on the left. 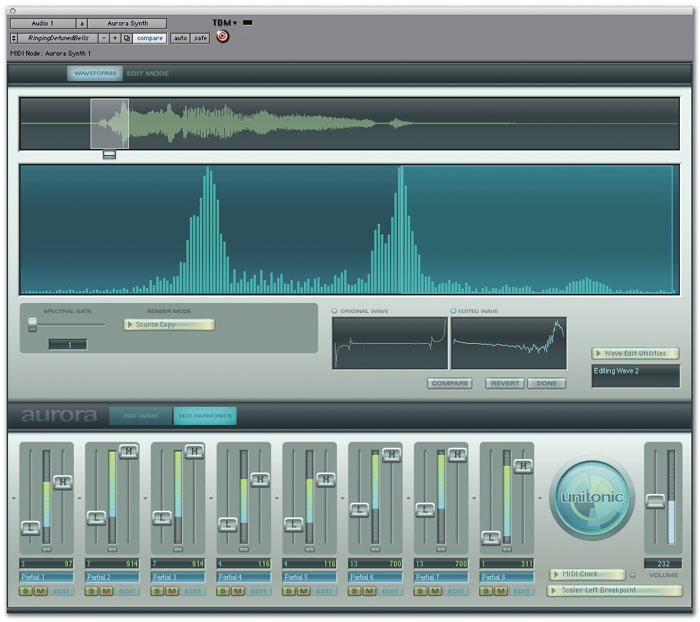 Each Aurora partial can contain up to eight separate envelopes, and a sound can be made of up to eight partials.The middle section is a row of buttons that select the various parameters for editing in the upper and lower sections. This also enables the faders in the lower section to have access to one parameter, but applied to all the eight waveforms or, 'partials' in Unitonic-speak, that make up an Aurora patch. The lower section is a context-sensitive mixer that directly relates to the middle section. You can Option-select multiple partials and perform group edits here, as well as muting and soloing. However, any changes you perform don't happen in real time; you have to keep re-triggering the key to hear the effects of your tweaking. It's not something I've encountered in a soft synth for some time, and although it's not exactly the end of the world, I did find it a little irritating after the hundredth key press. Each sound in Aurora can be made up of as many as eight partials. Each of these partials is, in fact, comprised of two separate sound generators: a carrier wave (confusingly, also called a partial) and a frequency/phase modulator called a 'timbre'. Each can be assigned to a multitude of waveforms, and the carrier can then be duly modulated by the timbre. This can result in the creation of some very complex waveforms indeed. There is also the ability to load in your own custom waveforms to add further spice to the mix; once you've loaded in your audio, you can scrub along it until you find a suitably exciting moment, then Aurora can provide you with a handy spectrum editor that filters down the sound to remove any unwanted harmonics and distils the results into something rather more musical. In my case, I took a backing vocal I had knocking around and managed to mangle it into something almost resembling a granular lead sound akin to Propellerhead's Maelstrom. However, you do have to work at it, and I didn't find it a particularly quick process. On the plus side, I recorded the output of Aurora into Pro Tools as I was tinkering with the waveform, and that alone generated enough interesting audio to keep a sci-fi sound designer inspired for a week! Theoretically, you'll be able to get 128 voices out of Aurora using a single DSP chip, although the more partials you use, the greater the reduction in polyphony. I set up a whopper patch and still managed to get 16 or so voices to sound at once, which is more than enough for most Aurora applications. Once you have your basic sound, you can the mangle it further with an impressive 12-stage looping envelope generator that works on each partial within the patch, should you so choose. You can have up to eight different parameters per partial controlled by their own envelope generators, including pitch, pan and amplitude. That means that with a full eight-partial patch utilising all eight envelopes per partial, you'll end up with a mind-boggling 64 independent envelopes thundering along at the press of a key! 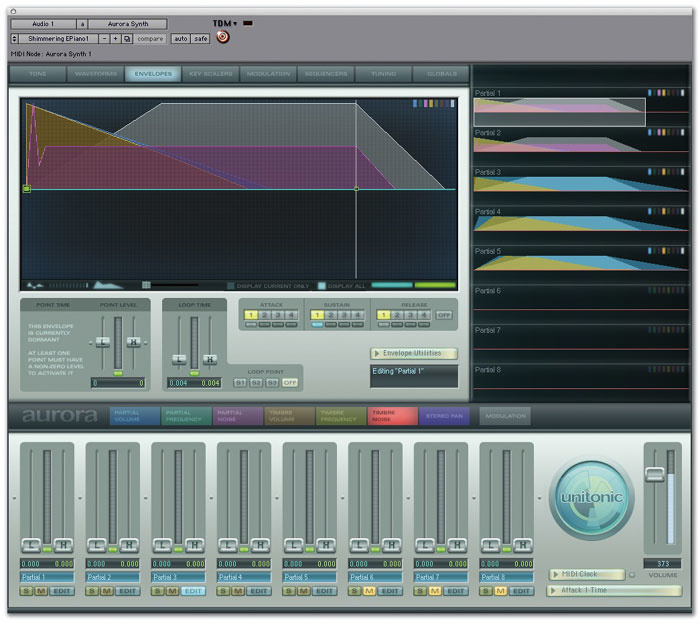 You can load audio from Pro Tools into Aurora to serve as waveforms for the synthesis algorithms. Aurora also sports a pretty comprehensive modulation matrix. Again the graphical interface is a real plus here: you just select the parameter you want and drag it to the desired level. In no time, I was sending one partial over to the left whilst another jumped a fifth and panned hard right, just by using the D-beam controller on my Roland V-Synth. Plenty of scope for fun and games here. Each patch also has a 32-step sequencer that you can use to manipulate elements within the partials. Anything from filter sweeps to pitch information can be specified to give a patch yet more movement. Irritatingly, though, the MIDI clock switches back to internal rather than external sync every time you change presets, so if you want a sequenced patch to sync to Pro Tools, you have to reset every one that you load. In the end I gave up auditioning them and moved onto some other sounds, as this was doing my head in! In fact, this brings me onto my main complaint with Aurora. In its current form, it's pretty buggy. For example, there's one bug where the volume levels can cause the synth to overload its own output; the bells section is particularly bad for this. In addition, changing the pitch of one partial to the strangely abstract increment of 999 (which equates to one octave up) when using the step sequencer caused that note to stop sounding. Also, if I held down some notes whilst changing patches, the resultant sounds could sometimes wildly differ from previous times I'd selected the same sound. I also found that volume levels differed considerably between some of the patches. The factory default sound is also set extremely high, so much so that the TDM plug-in overload indicator came on straight away when I played a note. Reducing the volume control rectified this, but I nearly leapt through the ceiling when I first tried it! Unitonic took my comments on board when I pointed them out and have assured me these problems this will be rectified when v2.02 is released shortly. There will also be a whole new array of patches included too. Sonically, Aurora is capable of a great many different things. It can range anywhere from Minimoog-style lead and bass sounds through to some very digital DX-style noises and right the way on to some almost PPG-esque tones as well. Interestingly, the DX-style tones reminded me of my old DX21, the FM having more of a four-operator type sound than the six-operator character of the DX7. I also found that quite a few of the sounds benefited from reverb or chorus which I added separately, as they could be a little thin and harsh on their own. I couldn't honestly say that Aurora set me on fire, and at its recommended retail price of $699, you can pretty much have your pick of the soft-synth universe — although if you need one that can run on Pro Tools DSP cards, the choice is not wide. It might be a grower, though: the presets are a good starting point, but I feel Aurora really comes into its own once you start getting your hands dirty under the bonnet. This is a synth that will reward experimentation and produce some never-before-heard sounds, as long as you have some time to spare. There are innumerable soft synths around, but surprisingly few that run on Digidesign's TDM cards. Of these, only DUY's Synthspider modular synth (reviewed in SOS December 2002) offers similar depth and programming potential to Aurora, though its architecture is very different. 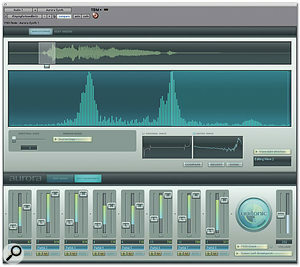 In the world of native synths, both Camel Audio's Cameleon 5000 (April 2004) and Virsyn's Cube (September 2003) provide sophisticated additive synthesis capabilities, including the ability to resynthesize audio from WAV and AIFF files. Native Instruments' Absynth 3 (April 2005) can also manipulate audio in interesting ways and is worth a look if you're into serious programming, but in terms of the sound it makes, NI's FM7 is Aurora 's closest comparison. Not just another sample-based soft synth with all the same old sounds. Can sound a bit thin and cold. A synthesizer in the truest sense of the word with plenty of scope for development.